SUPERMAX ABSORBENT PADS - ABSORBS 8 TIMES THEIR OWN WEIGHT! TIDDOX’s SUPERMAX ABSORBENT PADS are large drop cloths designed to absorb both water and oil-based liquids. 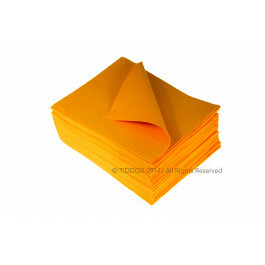 These thick, large orange cloths are industrial grade made of a high viscose material which has an amazing absorption capability of soaking up to eight times its own weight! High viscosity fluids are thicker than water, and found in automotive and industrial areas. Oil, grease, fuel, antifreeze, and some chemicals and solvents must be controlled before they get tracked around the workspace. They also have to be disposed of properly as hazardous waste. The SUPERMAX ABSORBENT PADS are as absorbent as sponges, making them perfect for your automotive shops or for absorbing marine spills. Each pad is 50 cm X 60cm, large enough to spread it out under the workspace to catch and absorb fluids. The fabric is strong and durable so that once it is soaked, you can remove it and dispose of it properly. It doesn’t come apart when you pick it up, and won’t fall to pieces as you move it. This cloth will absorb many times its own weight, and is a thick, heavy texture. It’s perfect for disposal tasks in which you are dismantling or salvaging materials and need to control any fluids that result. It is tough enough for you to walk on as you work, yet it will still absorb fluids. The SUPERMAX DROP SHEETS are more economical than the white OIL ONLY ABSORBENT PADS and the GENERAL PURPOSE ABSORBENT PADS because they are bulk packed 200 pads to a carton. Order a carton today and keep them handy as a cost effective solution for those unexpected (or regularly occurring) spills!